The Smart City concept is high on the hype curve right now. It is about making our cities smart - or perhaps really about how to build and sustain a physical and digital infrastructure, enabling intelligent interaction with your city. So what makes a city smart? In this special issue, we will explore this and especially focus on the role of geodata in the Smart City. And after all, who wouldn’t like to live in a Smart City? Above all, a Smart City is a city with a digital dimension. In a Smart City, data about the city and the citizens' use of it is collected and shared. The combination of the physical and social spaces with the digital space allows authorities, businesses, organisations and citizens to develop new solutions and services, and it has far-reaching perspectives: Increased efficiency, better well-being, energy savings, greater security, more citizen involvement, stronger democratic processes. Big data is an important aspect of the Smart City philosophy. Big data analysis methods and tools make it possible to exploit the value hidden in the large amounts of data produced every day: Open, structured data from public authorities and private businesses, unstructured data generated by our daily interactions on Twitter, Facebook and YouTube, data collected through our use of smartphones, sensor data from appliances, parking spaces, utility companies, buildings, etc. Almost all of this data is location-based, and therefore geography can constitute a strong common platform for compiling data from many different data sources. Further, often the geographical aspect is not just the common language, but rather the essence of the data collection that provides new value in the Smart City: The citizen may be offered services depending on his/her current location; Bluetooth records of drivers' smartphones can give information about queue times on the roads; streetlights can be turned off when the street is empty. 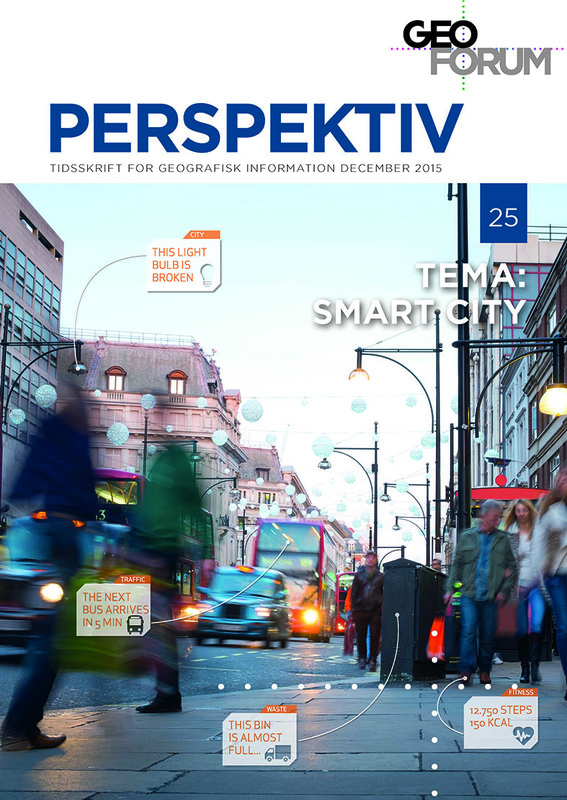 Denmark is at the forefront when it comes to the deployment of Smart City visions. This special issue will focus on Smart City, both as a concept and with examples of practical solutions, and on Big Data as part of these solutions. In particular, articles focussing on the use of geographic information as infrastructure and basis of analysis will be of interest in the special issue. The aim of the publication is to communicate the opportunities and practical challenges that arise in relation to the development of the Smart City. Smart Cities – 50 mia. ”ting” på internettet – og det skal styres!